A lot of people may not share my enthusiasm for the potato genome, hopefully you all enjoy eating potatoes. The stereotype of potatoes is lots of boring sameness one identical to the next. * Reality, as usual, is much more complicated. Tens of thousands of cultivars can still be found in the South American regions where potatoes were first domesticated. In America, breeders are constantly working to bring in desirable traits from those (often really cool looking) breeds and even wild relatives of the potato. They face both genetic barriers (species barriers are bad enough normally, but trying to introgress genes across a tetraploidy can be a mess) and consumer acceptance ones. This was driven home in a story at the NYtimes about Cornell potato breeders who have developed breeds which grow much better in upstate New York, but run into problems because the potatoes look and taste different than the couple of varieties of potatoes consumers and restaurants are used to (most notably Idaho grown Russet Burbanks**). Cornell Extension has been working on overcoming that barrier providing the potatoes to restaurants and, in what I think is a genius move, culinary schools throughout the region. If you happen to visit New York farmers markets take a moment to ask sellers about the breeds of potatoes they have for sale. *** The potatoes covered in the story are Salem, Eva (both white potatoes), Lehigh, Keuka Gold (yellow breeds), Adirondack Blue and Adirondack Red (both of which are just the color you’d expect from the name.) Purple potatoes in particular just look really cool, see image above. ***In fact, whenever you’re buying directly from a farmer, if you get a chance, ask about the breed of whatever you’re buying. More often than you’d expect there’s an interesting story about why he or she is growing that particular breed and where it came from. Posted in: agriculture, biology, Crop Profiles, food, Genetics, Plants. Ha! I just mentioned this article myself. I’ll check out the farmer’s market this weekend to see if any of these show up. I’d love to try making blue gnocci like they mention in the article. Let me know if you find them. 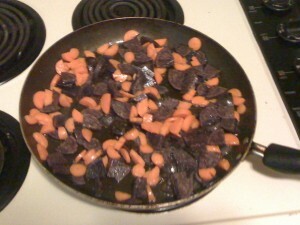 And the couple times I’ve tried them dishes with purple potatoes have been big hits.